If you have been keeping up with recent posts, you know my mom was recently diagnosed with celiac disease, and she has made many menu adjustments. The biggest challenge so far has been finding a gluten free bread she likes. There are a lot of options available, but Mom found them lacking in taste, texture, or both. She tried both off-the-shelf products and frozen ones, but none made good toast or sandwiches, both of which had been a regular part of her diet for years. I briefly toyed with the idea of making gluten-free bread for Mom. Dismay quickly set in as I searched for recipes and saw the number of different gluten free flour products necessary to bake a single loaf of bread! 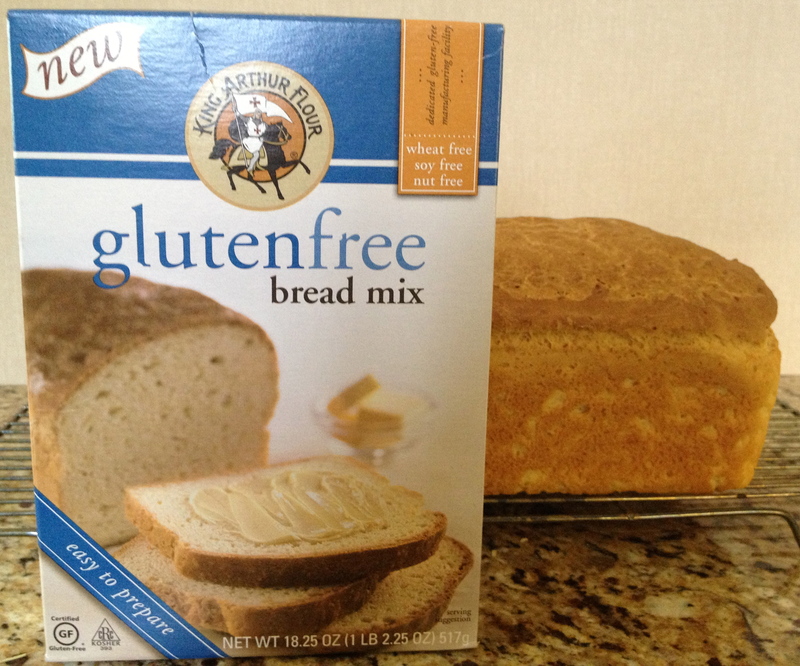 My research turned up a gluten free bread mix from King Arthur Flour, and since I already enjoyed using other King Arthur products in my kitchen, I bought the bread mix with a sense of cautious optimism. Based on my experience (which is now up to a half-dozen loaves), I recommend using a stand mixer (like my KitchenAid) for making the bread. You might be able to successfully mix it with a hand mixer, but my KitchenAid mixer makes it very easy. The recipe on the box allows for a vegan version, but I chatted online with one of King Arthur’s friendly bakers who recommended butter and milk, rather than oil and water, for a softer texture. The bread dough is very soft and moist, and not nearly as stiff as wheat bread dough would be, but just like wheat bread dough, it rises twice before baking. The bread smells heavenly while baking, and makes a very nice 9″ x 5″ loaf. The recipe indicates the bread can be baked in an 8″ x 4″ loaf pan, which I tried, but the 9″ x 5″ loaf is better suited for toast and sandwiches. I was very pleasantly surprised at the taste and texture of the first loaf I baked, but it had to be frozen before I could get it to Mom and I wasn’t sure how it would fare after thawing. My concerns were quickly put to rest when I had a text from Mom raving about the toast she had made, and later the same day, a second text arrived saying she had enjoyed a sandwich for lunch for the first time in weeks! Here are some tips Mom and I have developed to successfully bake and enjoy the bread. Definitely use milk and butter in the bread mix if you can. The bread’s texture is excellent with those ingredients. Freeze whatever you aren’t going to eat right away. We individually wrap 2 slices of bread together so it is easy to remove a single serving from the freezer without continually exposing the entire loaf to air and potential freezer burn. 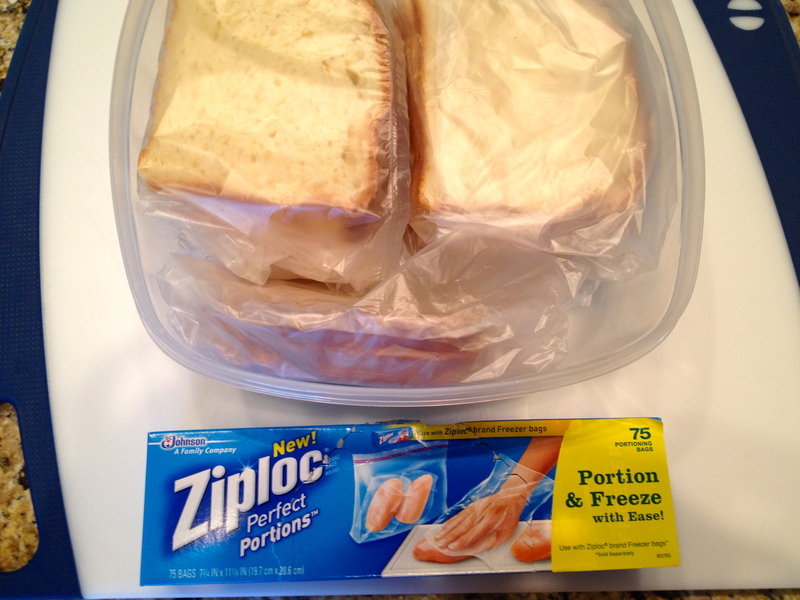 (Love the Ziploc Perfect Portions freezer bags!) Put the wrapped bread slices in a freezer bag or plastic container before freezing. When ready to serve, remove the bread from the freezer bags, wrap the slices in a paper towel and warm in the microwave for about 10 seconds on full power (your microwave could vary). Gluten intolerance is a problem for many people, but as Mom is learning, there are many good alternative selections. King Arthur Gluten Free Bread Mix is a delicious option for those who have given up traditional wheat bread by choice or necessity. I’ve found the bread mix in several markets in the Dallas/Ft. Worth area, but you can also order it online. Buy several boxes, because chances are, you will love this bread as much as Mom does! Our quest for fantastic foods more often than not leads us to the market’s dessert aisle because for many of us, dessert is really the main course. I have to admit to making my share of cakes from mixes with canned frosting in the past, but it has been years since I used one of the national brand packaged cake mixes or ready-to-spread frostings. Sure, we are trying to stay away from so many preservatives, but we have also come to crave homemade taste that usually doesn’t come from grocery store mixes. Nevertheless, my dessert radar went up when I saw The Frosting Queens’ all natural, ready-to-use frostings on Central Market’s “More, Please” blog. “All natural” was the hook for me, but I wondered how a shelf-stable container of frosting could maintain high quality taste and texture. After trying the Crowned Caramel Buttercream Frosting, I’m pleased to report The Frosting Queens have successfully cracked that code. 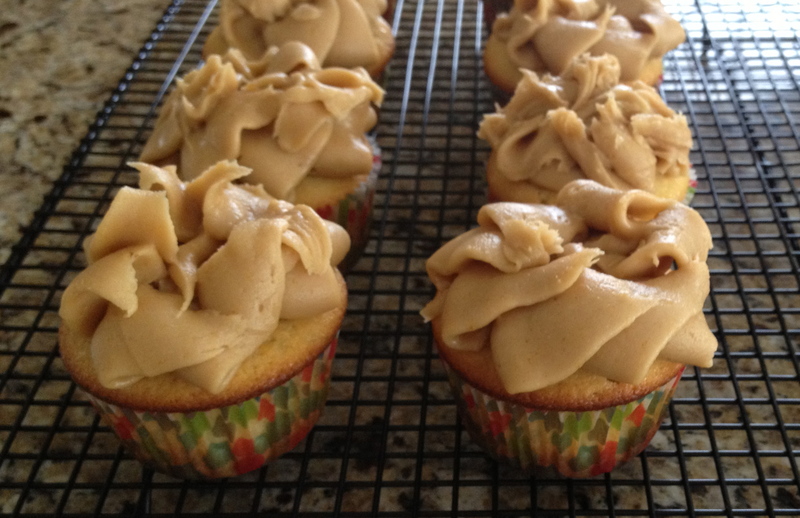 The experiment started with an almond cupcake recipe stashed in my “must try” file of electronic recipe clippings. Of course, it was necessary to taste-test the frosting before slathering it on the cupcakes, and this is where things almost went awry. The frosting was so creamy and caramel-y I could have eaten the entire bag. A tiny taste led to a teaspoonful, maybe two. Fortunately, I summoned up enough self-control to frost the cupcakes and get them to their destination. Preheat oven to 350°F. Line 12 cupcake cups with paper liners. Whisk together the flour and baking powder in a small bowl and set aside. In a mixing bowl, thoroughly cream together the sugar and butter. Beat in the eggs, one at a time, until thoroughly combined, then stir in the extracts. Gradually beat in the flour mixture, alternating with the milk, in several additions. Spoon the batter into the cupcake liners, filling them about 2/3 full. Bake the cupcakes in the preheated oven until a toothpick inserted into the center of a cupcake comes out clean, about 20 to 25 minutes. Cool cupcakes completely on a wire rack, then frost with The Frosting Queens Crowned Caramel Buttercream Frosting. The self-professed frosting queens are sisters, Angela and Annette, who grew up baking for family gatherings. Their love for children inspired themed family birthday parties, and to keep the kids happy and healthy, the sisters developed their ready-to-use frostings in four flavors: Velvety Vanilla, Charmed Chocolate, Striking Strawberry, and Crowned Caramel. They are made with real butter, contain all natural ingredients, and are gluten-free. The frostings are available online, and it would be great to have several on the pantry shelf when the baking urge strikes. We love Crowned Caramel, and Charmed Chocolate might just be the next flavor we try. 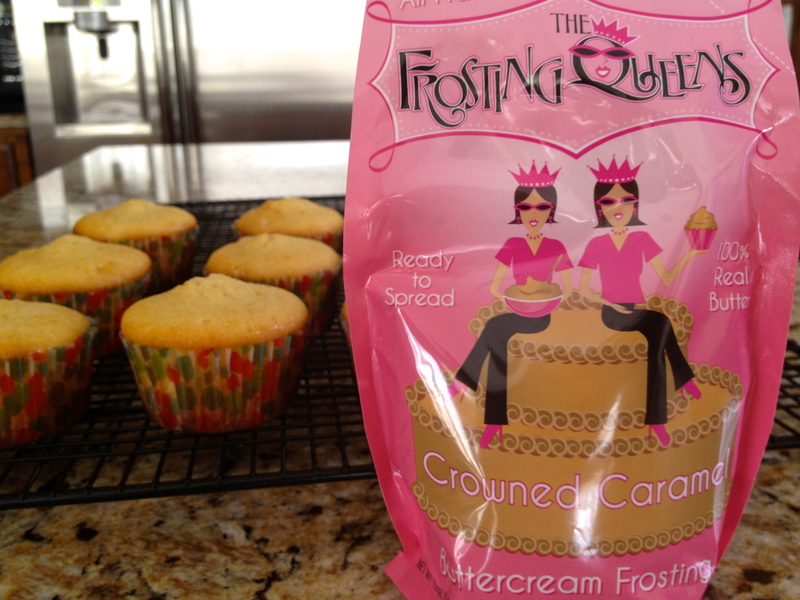 The Frosting Queens Buttercream Frostings will give your cake or cupcakes the royal treatment! It’s safe to say Karen and I put Tex-Mex at the top of our favorite foods list. Barbecue could be second. We both bootleg brisket from our hometown barbecue restaurant when we visit family. For me, its not a big deal — just throw brisket, sauce, beans, and potato salad in an ice chest in the back of the Tahoe, arrive home about 3 hours later and enjoy. Karen has more challenges getting her treasure back to Indiana. Her mom sometimes has a frozen brisket ready for her to pack and take home. The advance planning broke down once and she actually threw a hot, foil-wrapped brisket in her luggage on the way to the airport. Can you even imagine the reaction from the TSA canine security force? Drugs? Explosives? No, woof, woof! There’s beef in this suitcase!! I have to admit to cheating on our first barbecue love in recent years because we just don’t get home often enough for our barbecue fix, and frankly, it is pretty easy to cheat in Texas. There is a barbecue place on practically every corner. Seriously. I’ve also started dabbling in some home cooking barbecue recipes as well. Not the slow, pit-cooked barbecue famous in Texas. I’m more about integrating interesting barbecue sauces into my every day recipes, and an opportunity recently presented itself when a pot roast I cooked did not produce the melt-in-your-mouth result I expected. In fact, it was so tough I considered throwing it out. Fortunately, I had just picked up a bottle of Meyer’s Elgin Smokehouse Original Barbecue Sauce, so crockpot barbecue seemed like a good rescue option. What did I have to lose? I shredded the roast beef and threw it into the crockpot, covered it generously with Meyer’s Original Barbecue Sauce, and cooked it on low temperature for about 3 hours. 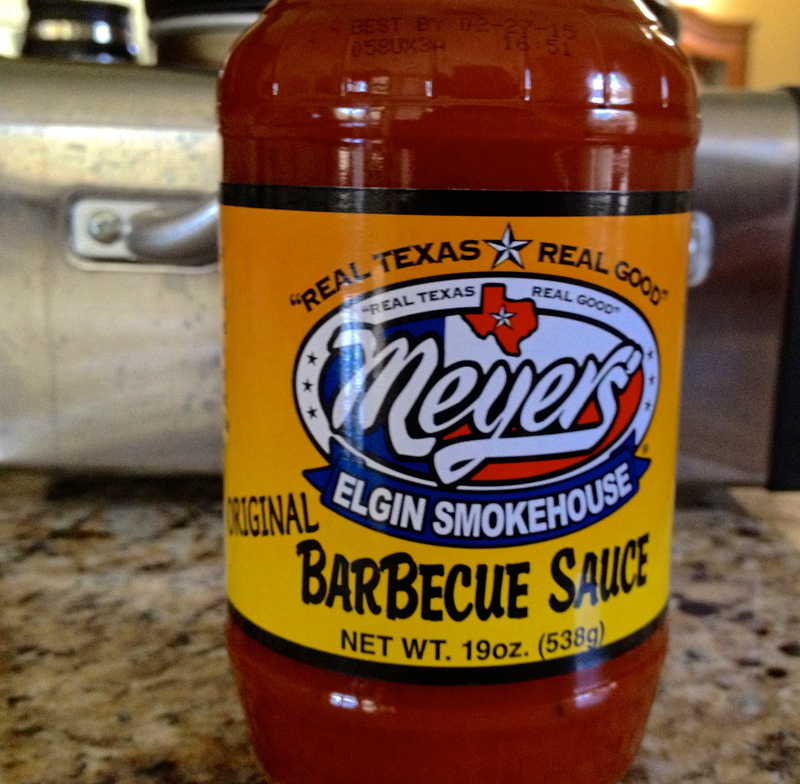 As the beef simmered slowly in the sauce, the aroma whetted our appetites and Meyer’s definitely saved the day. The sauce had the expected spicy kick, but it wasn’t uncomfortably hot. The sweet balance was just about right, too. 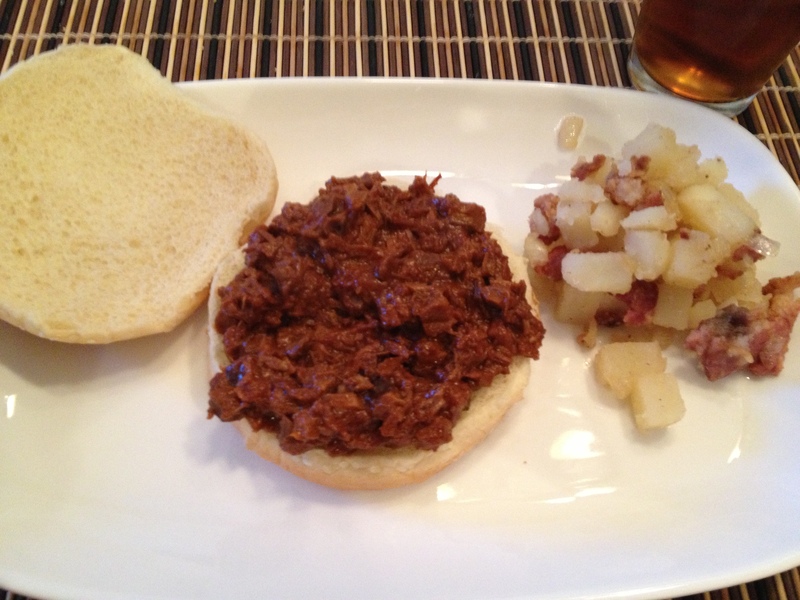 Best of all, the tough as cowhide roast beef was now deliciously tender barbecue on a bun, served along with German Potato Salad made by my grandmother’s family recipe. Happiness all around! Since the roast beef rescue, we brushed Meyer’s Original Barbecue Sauce on burgers while they grilled, and had some awesome spicy barbecue cheeseburgers. We will be repeating that often during this grilling season. The Meyer family began their barbecue dynasty in the late 1800’s with Harry Meyer making sausage from his German family’s recipe for friends and family. His son, R.G. Meyer carried on the tradition and founded Meyer’s Sausage Company in 1949. Another two generations later, great-grandsons Gregg and Gary Meyer preside over “Cue-topia”, a meaty empire of ribs, brisket, sausage, smoked turkey, and more available for online ordering. They also offer tempting sauces, rubs and marinades for barbecue DIYers. Check out their great barbecue combos, including a Texas BBQ Cookout package for $135 that feeds 20 people. Do the math on that deal, then add bonus points because you aren’t the one standing over the hot smoker for hours! Meyer’s savory products are promoted on the website with a heaping side dish of sassy; these Texas guys definitely have a sense of humor as evidenced by their toll-free number: 1.800.MRS.OINK. I laughed my way through the entire website. Stop by Cue-topia online and prepare for your mouth to water! We are planning a trip to Austin in a couple of months, and we will definitely be traveling about a half-hour east to Elgin to experience Cue-topia in person. Okra – love it or hate it? I absolutely love it, especially pickled. 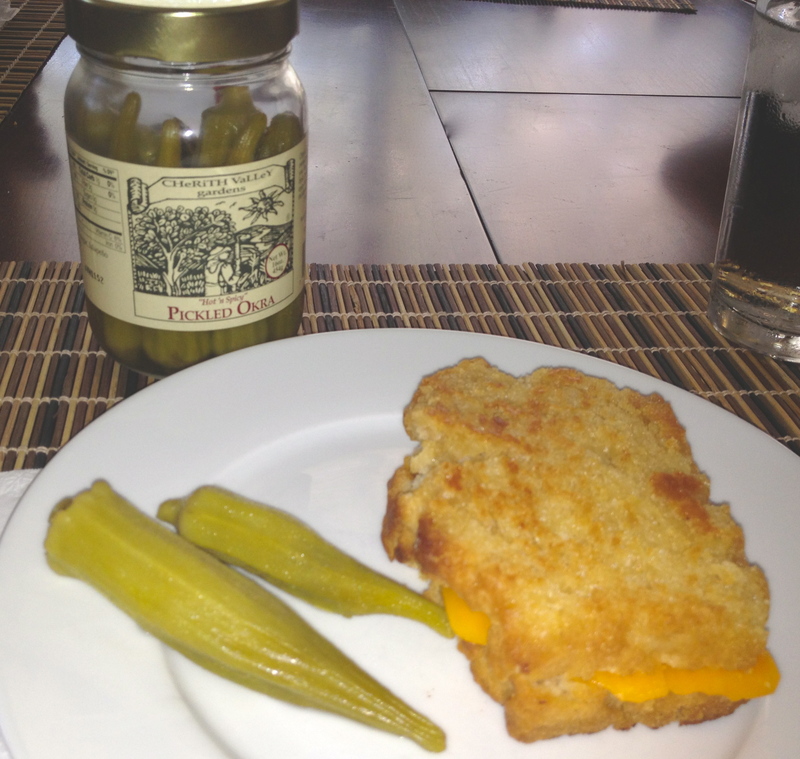 Cherith Valley Gardens Hot ‘n Spicy Pickled Okra was the perfect partner for my grilled cheese on rustic beer bread. So yummy! Check out this video showcasing King Arthur’s company culture and success, then head over to my favorite biscuit recipe using King Arthur Unbleached All-Purpose Flour and try them for yourself! We love this candy! 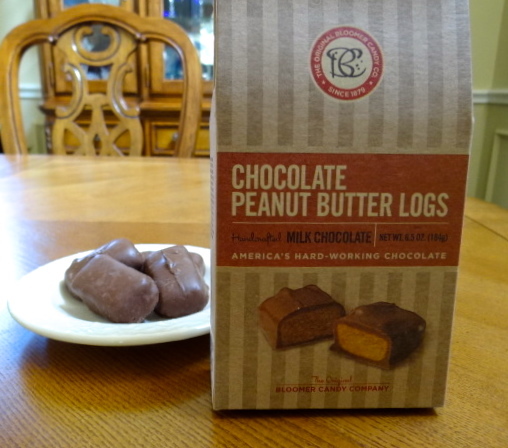 It brings dreamy chocolate together with the crispy, crunchy taste of vintage peanut butter logs. The box we bought was empty before we knew it! The Original Bloomer Candy Company has been operating in Zanesville, Ohio for more than 100 years. The company’s products are literally a part of American history, and maybe part of your own personal history,too. Orange slices, Bit-O-Honey and circus peanuts are just a few of the retro treats available on Bloomer’s website. I wonder how many Dum Dums, Bloomer’s fruit-flavored pops, Karen and I received at the end of children’s choir practice at church! The company prides itself not only on maintaining its history of producing quality candies, but also to its commitment to middle-class American values. This video from Bloomer’s website expresses the company’s operating philosophy, and shows the level of mutual commitment between employer and employees that provides the foundation for its success. Grab yourself a sweet taste of American candy history with some of The Original Bloomer Candy Company’s treats. A reader reached out to us to find Bloomer’s products, and sadly, it looks like The Original Bloomer Candy Company is no longer in business. Please contact us if you have information about this great company. If you tune into any of the kitchen competition or restaurant “rescue” television shows, you know the role of the sous chef. Second in command to the chef, the sous helps supervise the prep and line cooks, and fills in for the executive chef on his or her day off. How great would it be to have a sous chef in your kitchen? What if you could walk into the kitchen and find all the ingredients prepped for your evening meal? Wouldn’t it be completely awesome to have the sous chef prepare a meal on your “night off” from cooking, instead of hitting the nearest drive-through window after a busy day? Dream on, right? Two chefs at TexaFrance, Inc. have come up with the next best option – fresh, small batch pestos, sauces, salsas, and condiments that get meals off to a flying start without hiring staff for your kitchen. Canadian Jean Pierre Parant and Texan David Griswold joined forces to help home cooks create dishes that taste and look good with a minimum fuss. The Austin chefs dreamed up more than 40 different products, aimed at putting a virtual sous chef in your kitchen. We tried their Sun-Dried Tomato Pesto and the “first-bite” response was a unanimous “Yum”! Oil, parmesan, sun-dried tomatoes, pistachios, sunflower seeds, and spices combine for a delicious flavor blend that would be great topping fish or chicken, or mixed with pasta. 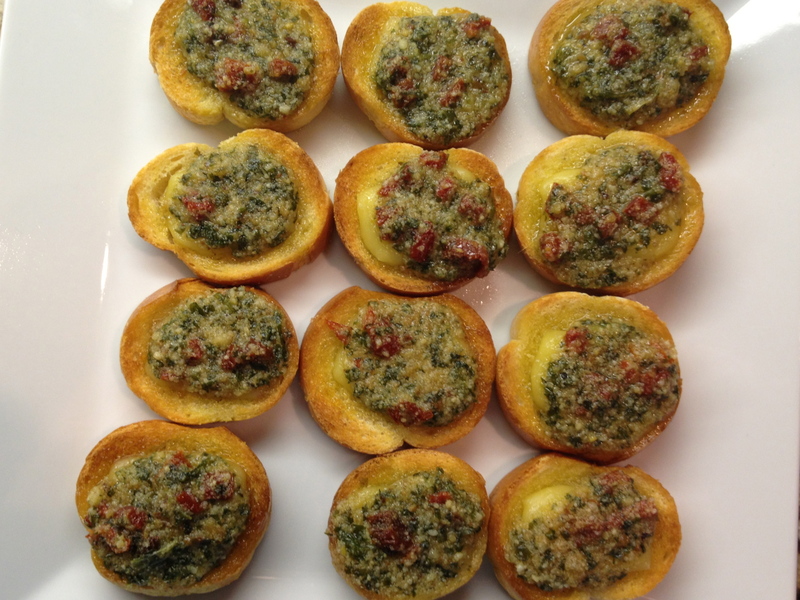 We whipped up some simple and delicious appetizers using ingredients we had on hand that really showcased this tasty pesto. Slice a small baguette into 1/2″ pieces, brush with extra virgin olive oil, and toast under the broiler until it is very light golden brown. Add a slice of mozzarella cheese, which in our kitchen, would be Rumiano Family Certified Organic, Kosher, American Humane Certified, Non-GMO Verified Mozzarella Cheese. (We are huge fans of this cheese, and Rumiano Family Organic Montery Jack.) Run the bread and cheese back under the broiler just long enough for the cheese to slightly melt. Top with TexaFrance Sun-Dried Tomato Pesto, and prepare to indulge. TexaFrance’s generous measure of sun-dried tomatoes and parmesan delivers a tangy, savory bite that was complemented by the creamy mozzarella. We enjoyed our apps so much, we almost skipped the main course! 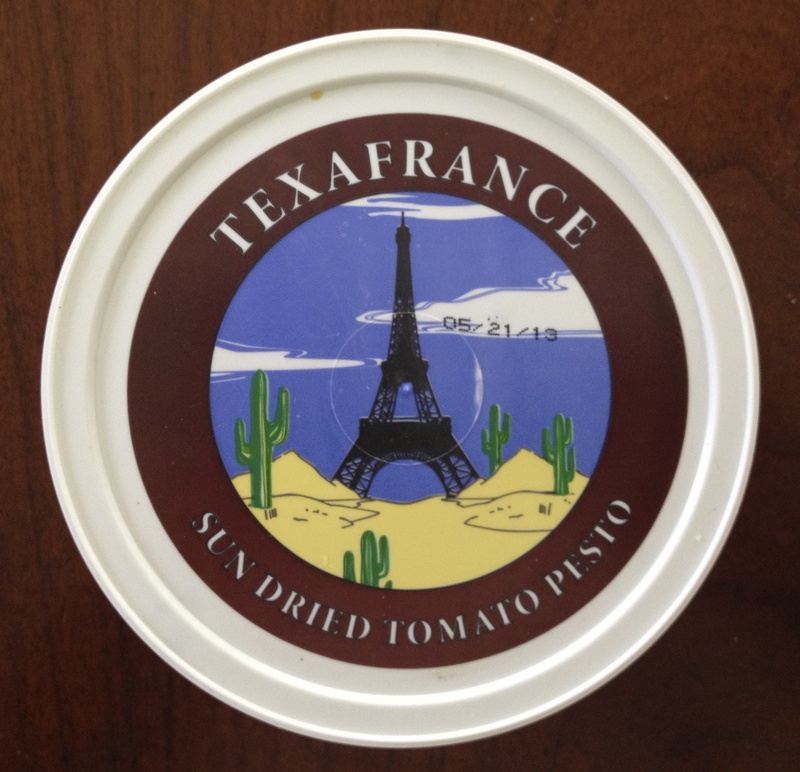 I bought TexaFrance Sun-Dried Tomato Pesto at Central Market in Dallas. The company’s website indicates their product locator information is coming soon, so keep watching for this great pesto and check out the entire line of products! I wish I had come up with the recipe for these fantastic green beans, but I didn’t. I also wish I could remember where I saw the recipe, but it was so simple to execute, I didn’t bookmark it. So with apologies to whoever came up with this great idea, here is a quick and easy recipe using Robert Rothschild Farm Horseradish Sauce you’ll want to try. Cook green beans in boiling water until crisp-tender, about 5 – 10 minutes. Mix together Horseradish Sauce and dijon mustard. Drain green beans well. Heat oil in large skillet, add green beans, and sauté, stirring constantly for about 3 minutes. 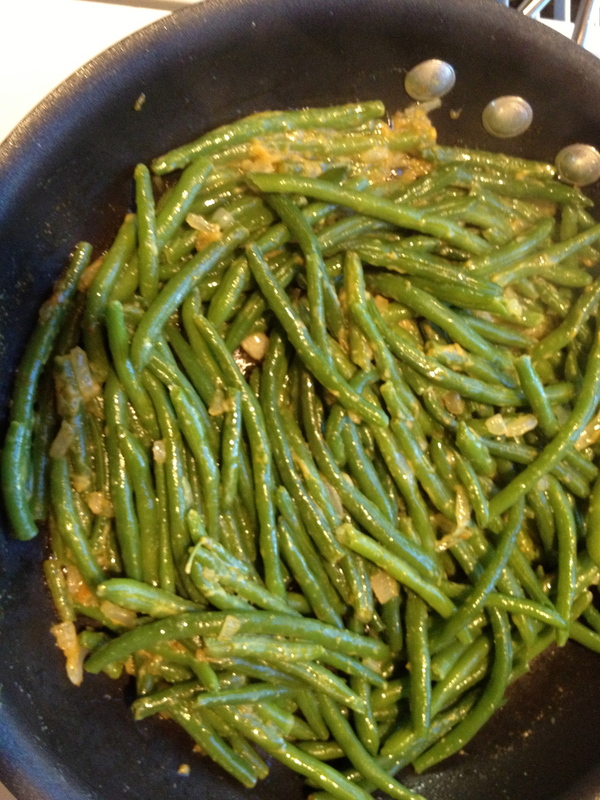 Remove from heat, and toss green beans with horseradish & mustard mixture. Enjoy! We seriously are not on the payroll of the marketing department at Cherith Valley Gardens; we just love their products! Their Mango-Lime Salsa is one of our favorites with generous bits of sweet mango, spicy jalapenos, and cilantro. We really enjoy it over grilled fish and chicken, and it is a tasty change of pace from tomato salsa for a chip and dip plate. Our friend and CVG owner, Terri Werner, recently posted a crockpot recipe on Facebook I knew I had to try, although we normally don’t do much crockpot cooking at our house. I’m usually not organized enough on weekday mornings to complete dinner prep before I get my workday started, and on weekends, I like to be a lot more hands-on in the kitchen. However, when I looked at my busy schedule for the week, Terri’s recipe sounded pretty perfect, first, because we love CVG’s Mango-Lime Salsa; second, the prep work couldn’t take more than about three minutes; and finally, I already had all the ingredients on hand. Done deal, or so I thought. My schedule got even crazier than I expected and the super-easy early morning recipe prep I had planned just didn’t happen, so we were in restaurants for dinner way more than we like. By the weekend, I was running on empty and the crockpot was beginning to look like a life saver. 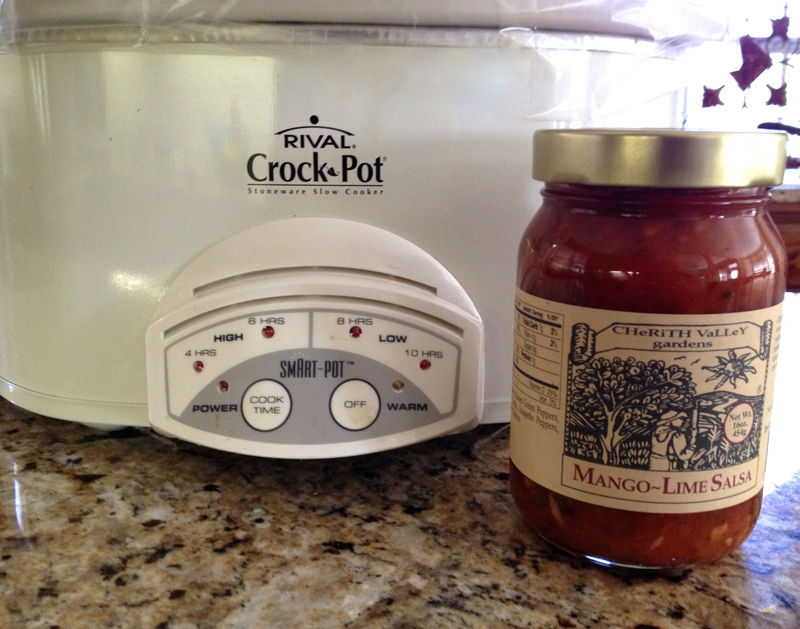 On Sunday morning, I lined the crockpot with the genius disposable liners that make clean-up a snap, added 4 boneless, skinless chicken breasts straight from the freezer, poured CVG Mango-Lime Salsa over the chicken and pressed “Go” on the crockpot. The chicken cooked over low heat for about 7 hours, during which I took a very long nap! When the chicken was done, I took it out of the crockpot and stirred in one cup of heavy cream to make a decadent sauce. Could this be any easier? We enjoyed the chicken over rice, with a green salad and some fresh bread. 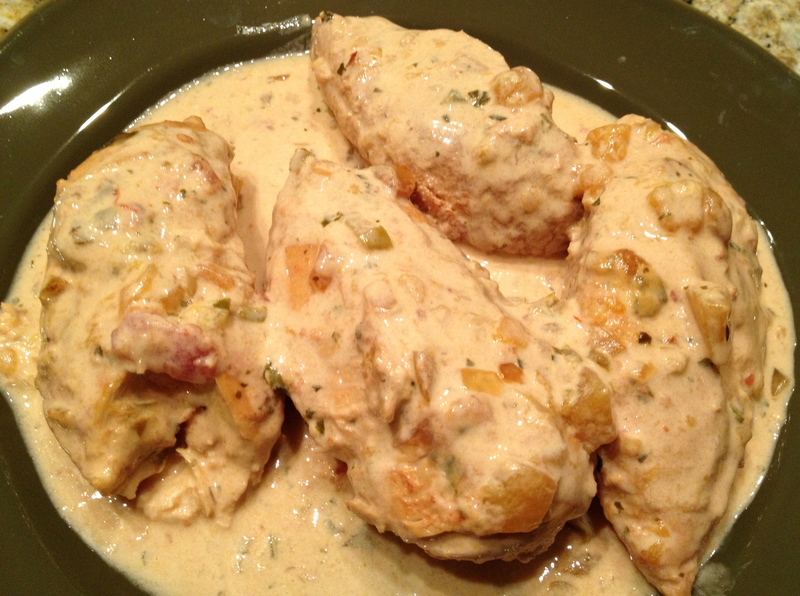 The chicken was fall-apart tender and the creamy sauce was subtly sweet and spicy. It was definitely the best meal of the week, and as an added bonus, the leftovers were even better the following day. I’ve said it before: having artisan and specialty food products in my pantry makes it easy to create delicious meals for family and friends. CVG condiments, sauces, relishes and salsas offer great taste and convenience, so they are often on the menu at our house. Cherith Valley Gardens marks its 20th anniversary this month, and since the beginning, the Werner Family has focused on providing the finest in gourmet foods from their family to yours. Well done, dear friends! Read more about the company’s history and get some of their tasty products for your pantry. Be sure to try their Hot n’ Spicy Corn Relish, too. It makes some amazing cornbread. 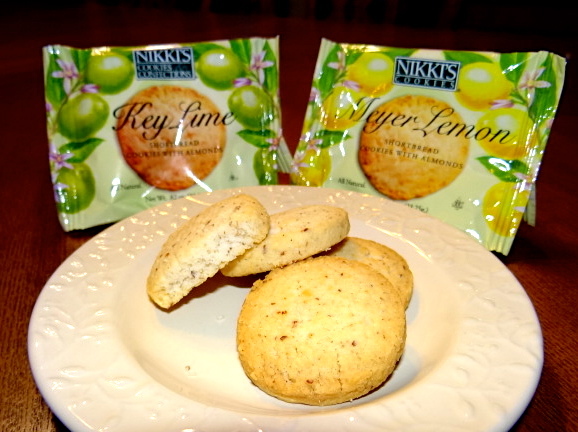 We found these neat 2-cookie packs at Central Market and loved the rich, buttery cookies with a just-right citrus tang. Nikki Taylor uses all-natural ingredients and family recipes in these delicious treats. A must-try, for sure!